The devotees staged plays portraying episodes from Krishna's childhood life, besides singing and dancing late into the night to the beatings of tabla and dholak and as harmonium, jhaal and flute played for hours. The festival of Janmashtami was celebrated with full fervor in Israel as hundreds of devotees, mostly Jews, chanting "Hare Krishna, Hare Rama" descended here from across the country to celebrate the birth of Lord Krishna. 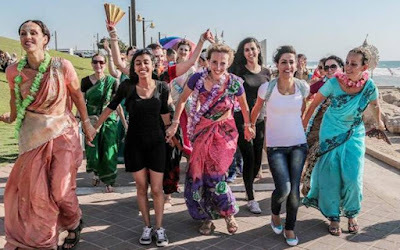 Kibbutz Barkai, one of many agriculture-based collective communities in Israel, is located close to a small township of Harish, which has come to be identified with followers of Lord Krishna popularly known here as "Hare Krishnas". Several devotees along with their families have settled down in Harish and religiously practice the tenets of the sect they learnt about during their visits to Vrindavan and Mayapur in India. The fanfare surrounding the celebrations has also caught the attention of many others who see it as a must-see event. "I have a strong attraction towards Indian culture but this group has also contributed majorly to the strong inclination and I haven't missed out on these celebrations since I was introduced to them some 14 years ago," said Karen, who came from a small town near Jerusalem. "This is probably the biggest gathering of devotees in years and we made adequate arrangements having sensed such a massive turnout. The popularity of the teachings of the sect has been constantly on the rise in Israel and it doesn't come as a surprise," a devotee said . The practices of the sect "brings a welcome relief amid the chaos surrounding the region, lifting people's spirits", another devotee said. Krishna Prasadam, comprising 108 vegetarian dishes, was served to the guests after the cultural programmes.